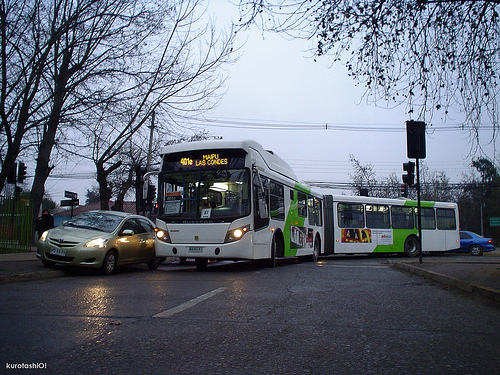 A year after its mangled implementation, Transantiago, the ambitious program to restructure Santiago’s sprawling and inefficient bus system, is still generating quite a bit of buzz. Last week, for example, The Economist published a piece on the political fallout from Transantiago, suggesting that the precipitous drop in President Michelle Bachelete’s approval ratings were caused by the system’s shortcomings. Recently I’ve heard many questions about the future of Santiago’s bus system: should it return to the partially de-regulated operations of the 1990s? Or maybe even go back to the totally deregulated transit of the early 1980s? The answer to these questions is unequivocal: no. Overall, the service during the 1980s and 1990s was extremely poor, resulting in unprecedented gridlock, high accident rates, increased air pollution, and long travel times. During this period, the upwardly mobile, whose incomes rose during the economic boom, turned their backs on mass transit, opting for the convenience of cars, which flooded the streets and only exacerbated the congestion and air pollution plaguing Santiago. High-capacity Bus Rapid Transit for the main corridors, with bus-exclusive lanes and better enforcement, prepayment systems inside all stations, integration facilities, and centralized control. Flexible bus services to reduce large number of transfers and serve high demand areas (express routes, short loops, etc). More funding for mass transit without increasing user fares. Congestion pricing for cars is one option for raising revenue while also reducing traffic and air pollution. Better communication between the bus system managers and the general public, sparked by a public outreach and education campaign. These and many other improvements are on the agenda of political leaders and local planners. I’m confident that if these changes are realized, Transantiago’s initial problems will be nothing more than a bad memory, soon forgotten like the disastrous deregulation in the 1980s. For more detailed information, click here and here.